White Pass: The "Dead Horse Trail"
Chilkoot Pass: The "Golden Staircase"
Home / Special Collections / Collections / Online Exhibits / Klondike Gold Rush: The Perilous Journey North / White Pass: The "Dead Horse Trail"
"The inhumanity which this trail has been witness to, the heart break and suffering which so many have undergone cannot be imagined. They certainly cannot be described." ~ Clifford Stifton, Canadian Minister of the Interior, 1897. ~ Detail from Hegg photo, Neg. #334. Circa 1897. Conditions on the White Pass trail were dreadful. The route was narrow, steep, slick and overcrowded. Nearly 3,000 pack animals died. 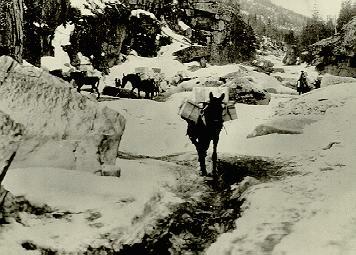 Drivers rushing over the pass had little concern for beasts. Exhausted horses starved, were hurt on rough ground, became mired in mud and fell over cliffs. 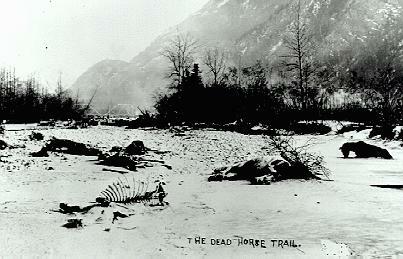 Novelist Jack London, a witness, renamed White Pass the "Dead Horse Trail." Circa 1897. ~ Detail from Hegg 3101. Continue to next section, "Chilkoot Pass, The Golden Staircase"